Tough competition, slowing growth, a wall of debt, and an untested CEO are crushing the once-iconic retailer. J.C. Penney's (NYSE:JCP) stock recently dipped below $1 per share, sparking concerns that it could be de-listed after plunging about 70% in 2018. Yet some bulls may think that J.C. Penney could still rebound from its multiyear rout, since it looks ridiculously cheap at about 0.03 times next year's sales. However, the retailer trades at a bargain basement valuation because investors can't see any viable ways to fix the business. Let's look at the four main reasons J.C. Penney is becoming a penny stock -- and whether or not it can turn things around. J.C. Penney's weak productivity might be manageable if its comparable-store sales were improving. Unfortunately, that key metric also hit a brick wall over the past year. Source: J.C. Penney quarterly reports. J.C. Penney expects a low single-digit decline in comps for the full year, versus its prior guidance for flat growth. Wall Street expects its total revenue to decline 4%. A slight dip in full-year comps might seem manageable, but the chain is using aggressive markdowns to buoy its top-line growth. That strategy caused its gross margin, on a trailing-12-month basis, to contract over the past few years. 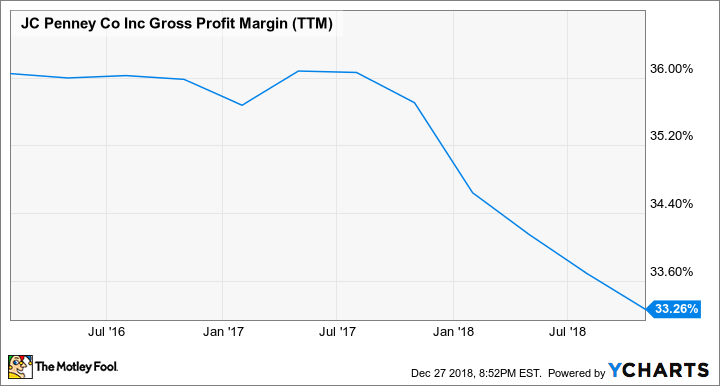 JCP Gross Profit Margin (TTM) data by YCharts. Last quarter, the company attributed its gross margin decline (down 210 basis points year over year) to the liquidation of "slow moving and aged inventory." J.C. Penney plans to gradually improve its margins by selling more nonclearance products, launching more private label brands, improving its inventory management, and using in-house analytics to better understand customers' shopping habits. But those strategies don't fully address the competitive threats, changes in shopping habits, or even the looming threat of tariffs that could make it tough for the retailer to expand its margins. That's why analysts expect J.C. Penney to report a full-year adjusted loss of $0.94 per share this year -- compared with a profit of $0.22 last year. The company's long-term debt rose 3% annually to $4.16 billion last quarter. 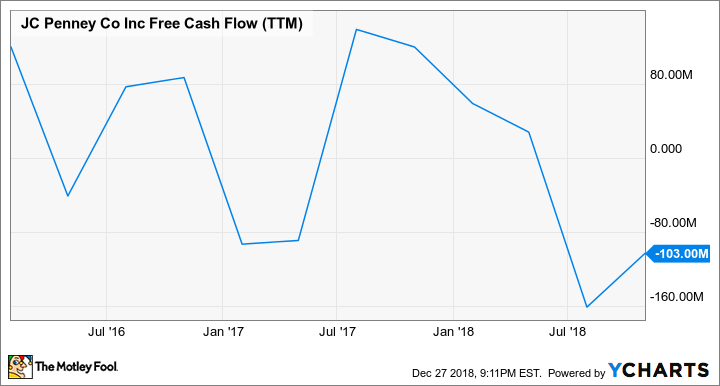 Meanwhile, its cash and equivalents fell 9% to $168 million, and its free cash flow (FCF) remained negative over the past 12 months. J.C. Penney is desperately trying to achieve a positive FCF for the year by closing stores and cutting costs. However, $900 million of its debt matures in 2020, and nearly $2 billion more needs to be paid off in 2023. Those two blows could push the retailer to the brink of bankruptcy if its cash flows don't improve next year. That massive debt load also makes it an unappealing takeover target, since it increases its enterprise value to nearly $4.7 billion -- versus its market cap of about $300 million. That gives it an EV/sales ratio of 0.4, much higher than its price-to-sales ratio of 0.03. J.C. Penney's ongoing decline caused many of its C-suite executives -- including CEO Marvin Ellison, CFO Jeffrey Davis, and chief customer officer Joe McFarland -- to resign. The retailer was left without a permanent CEO earlier this year before it hired Jill Soltau, the former CEO of crafts and fabric retailer Jo-Ann Stores, to fill the role. For now, Soltau's main turnaround strategy is to aggressively reduce J.C. Penney's inventory (down 5.4% annually last quarter) with aggressive markdowns to cut weaker products while promoting its stronger ones -- like women's apparel, activewear, special-size apparel, and jewelry. Clearing out the junk instead of hoarding it sounds like a smart first step, but it's a risky strategy that could make it tough for J.C. Penney to sell pricier products in the future. J.C. Penney shouldn't be considered the next Sears yet -- it can still close plenty of stores to cut costs, shrink them to focus on a smaller selection of higher margin products, or monetize more of its real estate by selling its properties and leasing them back. But the retailer is still lost in the woods, and it can't be considered a viable turnaround play until its growth stabilizes and it generates FCF growth again.